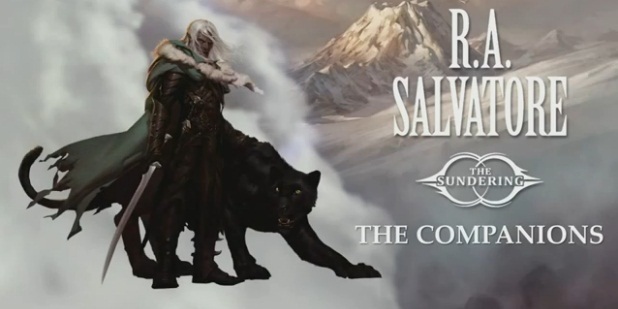 So I just finished reading R.A. Salvatore's latest book The Companions and I have to warn, what follows here will be rife with spoilers. So if you still intend to read this book, or are yet in the process of doing so, please kindly back away from this post, as I'd hate to spoil anything you didn't want spoiled. There, fair warning has been given. I often find when reading Salvatore's books, that various events and insights I find within the pages strike haunting chords, either harmonizing or providing sharp counterpoint to my own life. In many of Salvatore's recent books, following the life of a dark elven ranger name Drizzt Do'Urden, there has been a weighing darkness, this looming sense of loss and inevitability. I've seen this as a reflection of things that must be going on in Bob Salvatore's own life, or reflections on things he's been through. You see, Bob isn't the best author in the world (except when it comes to detailing a ferocious fight scene!) but he's got a gift that you can trace back to some of his earliest work. Bob lives in his stories, just as much as any character. You could see it in his story Echoes of the Fourth Magic, with a protagonist who was clearly Bob setting out on his first adventure; you could feel him investing his love for his family into his love of fantasy when a certain beardless dwarf named Geno joined a young man from another world and helped him defeat a dragon and reforge a spear in The Woods Out Back; and you hear his voice in all of Drizzt's reminisces throughout the many books chronicling the adventures of THE dark elf. In his book The Last Threshold, which some may remember me writing about earlier, the fading light of adventure seemed to finally give way to a bittersweet peace. It was a closing I was content with at the time. I remember speculating that perhaps Bob had decided that some two and a half decades marked a good time to let his old friend finally rest. He certainly couldn't have chosen a way for Drizzt to pass, his body broken but his spirit whole once more, certain in the path he'd chosen. Then I discovered that this book, The Companions, was hitting shelves as the kickoff to Wizards of the Coast's pre-edition change multi-author epic, The Sundering, and I was, I'll admit, a little disappointed. "Ah Bob," I remember thinking "what have you let them drag you into now?" For those not "in the know" as it were, Wizards of the Coast is the Hasbro subsidiary who owns what once was the preeminent RPG of all time, Dungeons and Dragons. After their 4th Edition of the game failed to take off and the gaming giant found themselves being pummeled in the sales market by a little gaming company from Renton, they decided a strategic withdrawal was in order and they began their attempt to once again reboot their franchise with a fan-tested and player approved new edition, the upcoming D&D Next (gods willing they'll come up with some other name to print on the cover of the actual books when they hit shelves). And with this new edition, Wizards initiated a long-standing tradition; you see, every time Wizards drops a new edition, they blow up Ed Greenwood's brainchild in colossal fashion, killing gods and heroes alike, to clear out material inspired by their old products to introduce material inspired the new. Which brings me back to my despair at seeing Bob spearhead this edition initiative with beloved characters I thought had finally earned their rest. I didn't believe there was any way these characters, these friends who had been with me for twenty of my twenty-eight years of life, could possibly be spun back into existence as part of a corporate product roll-out in any way that wouldn't seem contrived and trite. And I wasn't entirely wrong. Bob had gotten incredibly real with his recent works, had explored the heartache and hopelessness that is the real world, scarcely filtered by the lense of fantasy. I had almost forgotten, trudging through this wasteland of small triumphs and pyrrhic victories, punctuated by grief and failure, the reason I had fallen in love with Salvatore's writing to begin with. You see, Salvatore is a dreamer, just like me. That knowledge and remembrance came flooding back to me as I opened up this latest book and saw that he had dedicated to none other than the heroic drow ranger whose adventures have been the backbone of Bob's writing career for nearly three decades. And with that knowledge I dove into an adventure that was so much more than I could have hoped for. What I had feared would be a contrived attempt to revitalize a series that was one of the few solid supports in a once great franchise, now lumbering to its death with vain hopes for replicating past glories (see-Dungeons and Dragons), was instead a fierce and wild denial of the realities it had so brutally explored up to that point. I don't know if Bob remembered something he had forgotten, or if he patiently set the stage for this reminder, but he brought a glaring truth roaring back to life alongside the Companions of the Hall:we don't read fantasy to be reminded of reality, we read it because we yearn for a world where the good guy does win, and good does triumph over evil, and all the good things a person does do make a difference. So what if The Companions of the Hall are being conveniently resurrected at a time when Wizards needs them most? Heroes deserve to win, magic exists in fantasy to explain away the improbable and make the impossible possible, and everyone deserves a second chance. That's what The Companions is, on many levels. It's a second chance for Drizzt to find the joy he lost, for Bruenor to fix the mistakes he left behind, and for Regis to be the hero he always loved his friends for being. And if it turns out to be a second chance for Gary Gygax's heroic legacy, the game that made RPG's what they are today, all the better. I'm all in.